European young farmers share a high risk from volatility and the brunt of current low commodity prices but are on are on track with ideas for Common Agricultural Policy reform. 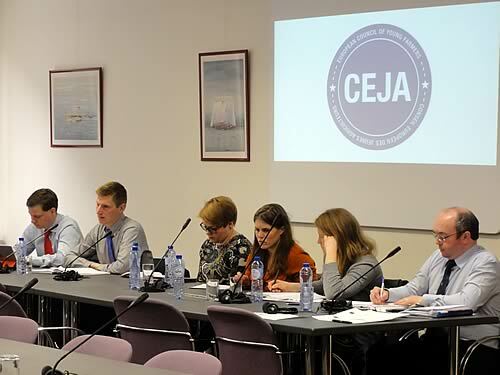 Members of the European Council of Young Farmers (CEJA) gathered in Brussels to discuss the current market crisis with European industry and government representatives. Delegates questioned the effectiveness of the current Common Agricultural Policy (CAP) regarding volatility, European global competitiveness and input to the next CAP reform. Tools to manage volatility, intermediary insurance schemes, biofuels and the environment were high on the agenda as well as hopes for new EU global markets and support from the European investment Bank for individual farmers. “It’s clear that European young farmers are discussing the same issues across the member states and we are focussed on CAP 2020. Our discussion provided a tangible exchange of thoughts among young farmers across the EU. The National Federation of Young Farmers’ Clubs (NFYFC) has received support from the NFU to help retain their membership of the European Council of Young Farmers (CEJA) and currently shares its membership with the NFU Next Generation Policy Forum. This enables NFYFC CEJA representatives to attend pan-European working groups, seminars and conferences in a bid to influence policy makers and industry to put young farmers’ needs and aspirations high on their agenda.